An array of new machinery and technology from global manufacturers displayed at SteelFab 2016, turned out to be a magnet for regional fabricators. 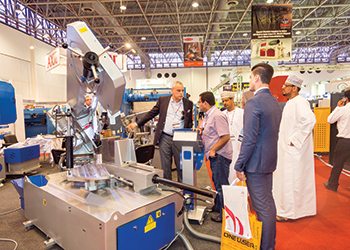 Held over three days last month, the 12th SteelFab featured more than 370 exhibitors representing nearly 1,000 brands from 43 countries at all the six halls of Expo Centre Sharjah, UAE, besides new special focus areas, pavilions, live displays, technical seminars and product presentations. Last year’s event had featured 350 exhibitors and attracted 10,324 trade visitors from 83 countries. This year, the premier steel fabrication and metal working exhibition brought together visitors from nearly 75 countries. Foreign pavilions included Germany and Taiwan, apart from a strong presence of manufacturers from Italy, Turkey, China and India. In a first for the region, Aliyat, distributors of Dugard, displayed virtual reality technology in the Middle East to demonstrate CNC (computerised numerical control) machines produced by TOS Varnsdorf of Czech Republic for application in industries like oil and gas, automotive, defence and general metal fabrication. GMA Garnet Group, a global marketing and distribution company providing industrial garnet for surface preparation and waterjet cutting industries, put up tetraCore products for the first time in the region. Bulmor raised the curtains on two of its new products – the side-loader truck and multidirectional truck. Another new product that drew strong visitor interest was the H beam automatic welding line from Arwani. Wright & Wood International, the official partner of US’s InfoSight Corporation, showcased the world’s first fully automatic continuous-feed desktop laser printer. InfoSight, a leader in identification and traceability solutions, manufactures metal tag printers, special purpose metal tags which can withstand temperatures as high as 1,000 deg C. The products are used in shot blasting, galvanising painting, pickling and annealing. SteelFab also saw the launch of a new vertical – Fasteners World Middle East – besides the introduction of two special focus areas – Stainless Steel and Wear Resistant & Hard Facing Cladding. “With the addition of Fasteners World ME and the new special focus areas, the SteelFab is now the largest and most comprehensive industrial event of its kind in the entire region,” said Saif Mohammed Al Midfa, CEO of Expo Centre Sharjah. Other special focus areas included welding and cutting, machine tools and pipe and tube machinery along with the three special segments of Steel-Tech, Fabricators Pavilion and Steel Showcase. The technical seminars looked into topics such as lean manufacturing solutions, application of PFP materials, advance processing technologies, reverse engineering and software applications, among others. SteelFab is a reflection of the growth of the Middle East industry, said the organiser. “The regional industry has been quick in catching up with global trends and though there is a lag in technology adaptation, fabricators are keeping pace and are also flexible in adapting to new solutions,” said Midfa. SteelFab 2016 featured more than 10 laser machines from leading manufacturers, including Baykal, Durma, LVD and Trumpf and, on live display, helping visitors understand first-hand experience how they consume less power and offer better safety, material scrap savings, cutting properties, low maintenance, flexible operation, improved edge quality and faster changeover. Given the region’s strong acceptance of robotics, the event featured ABB Robotics, Fanuc Robotics, OTC and Kawasaki Robotics and others.